This page Right-wing politics is part of the politics series. Right-wing politics hold that certain social orders and hierarchies are inevitable, natural, normal or desirable, typically supporting this position on the basis of natural law, economics or tradition. Hierarchy and inequality may be viewed as natural results of traditional social differences or the competition in market economies. The term right-wing can generally refer to "the conservative or reactionary section of a political party or system". The political terms "Left" and "Right" were first used during the French Revolution (1789–1799) and referred to seating arrangements in the French parliament: those who sat to the right of the chair of the parliamentary president were broadly supportive of the institutions of the monarchist Old Regime. The original Right in France was formed as a reaction against the "Left" and comprised those politicians supporting hierarchy, tradition and clericalism. The use of the expression la droite ("the right") became prominent in France after the restoration of the monarchy in 1815, when it was applied to the Ultra-royalists. The people of English-speaking countries did not apply the terms "right" and "left" to their own politics until the 20th century. Although the right-wing originated with traditional conservatives, monarchists and reactionaries, the term extreme right-wing has also been applied to movements including fascists, Nazis and racial supremacists. 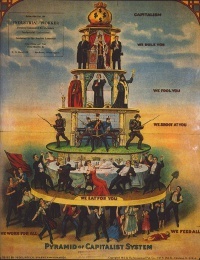 From the 1830s to the 1880s, there was a shift in the Western world of social class structure and the economy, moving away from nobility and aristocracy towards capitalism. This general economic shift toward capitalism affected centre-right movements such as the British Conservative Party, which responded by becoming supportive of capitalism. In the United States, the Right includes both economic and social conservatives. In Europe, economic conservatives are usually considered liberal and the Right includes nationalists, nativist opposition to immigration, religious conservatives and historically a significant presence of right-wing movements with anti-capitalist sentiments including conservatives and fascists who opposed what they saw as the selfishness and excessive materialism inherent in contemporary capitalism. Unless indicated otherwise, the text in this article is either based on Wikipedia article "Right-wing politics" or another language Wikipedia page thereof used under the terms of the GNU Free Documentation License; or on original research by Jahsonic and friends. See Art and Popular Culture's copyright notice. This page was last modified 12:46, 25 November 2018.